The translation of Enchilada Suizas literally means Swiss Enchiladas. This is my version of the signature dish at Samborn’s Restaurant in Mexico City, the one in the Casa de Azulejos (House of Tiles) in Mexico City’s historic central district. Some people say it was created as a “tourist” type meal. Calling the dish “Swiss” was a tribute to the large amount of cheese and cream, which is used in the recipe. For whatever reason they were invented, I simply know they are one of my favorite types of Enchiladas. 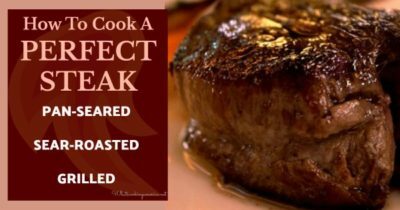 This recipe and photos are courtesy of Cynthia Detterick-Pineda of Andrews, TX. * Learn How To Make Corn Tortillas. In a large pot, boil the chicken in enough water to cover completely; add the bay leaves and peppercorns while boiling. Once the chicken is completely cooked, remove from heat and let cool. NOTE: This can be done the day before making these enchiladas, or you can even use leftover chicken that has been de-boned and shredded. Remove the husks from the tomatillos before using (the husks are inedible), and rinse under running water before using as the tomatillo is covered by a sticky substance. 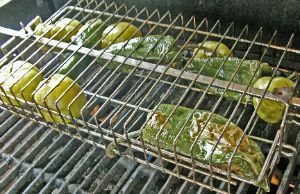 Roast the cleaned tomatillos along with the Poblano chiles over an open flame or under the broiler in your oven. Once the skins have charred and are beginning to burst open, remove from heat source, place under a damp towel, and allow them to cool. When they have cooled to the touch, remove the skins and seeds from the roasted poblano chiles. Remove from the heat and place in a slightly damp towel, allow to cool. Cooling the chile in a damp towel will help to loosen any skin that is still stuck on the chile pepper. Once cool, carefully peel the skin from the chile pepper, remove the stem end, and slice open to remove the seeds. Place the Poblano chile peppers in the bowl of your food processor or blender. With a sharp knife, coarsely chop the roasted tomatillos and add these to the food processor also, along with the diced onion. Salt can be added to taste after these have been blended into a puree. If the tomatillo/pobano sauce seems too “watery,” drain them by place in a coarse mesh sieve and allow the excess liquid to drain off. Set tomatillo/poblano sauce aside. Preheat oven to 325 degrees F. Butter a 9- by 13-inch casserole dish for the enchiladas. In a large frying pan over medium heat, add 2 tablespoons of the butter and melt; add the spinach and allow it to cook down completely. Add the remaining 2 tablespoons of butter to the cooked spinach and slowly stir in the Crema Agria until the spinach is completely coated. Add the shredded Swiss cheese to this mixture and allow it to melt, stirring frequently. Once the cheese has melted, add 1/2 cup of the roasted Tomatillo/Poblano Sauce which you made earlier. Reserve the remaining roasted Tomatillo/Poblano Sauce to serve as a sauce table side. Shred the cooled chicken and place in a large bowl. Mix in the grated Cojita cheese and about 1/4 cup of the spinach/cheese sauce mixture. NOTE: If you are using fresh or homemade corn tortillas, you do not need to heat/soften them prior to making your enchiladas. To soften a corn tortilla, grab it with tongs, place it in hot corn oil in a skillet, turn almost immediately and then hold up to drain (you want to soften the tortilla not cook it). You can also heat them on a Comal or in the microwave if the oil part is a problem for you. * A Comal is a flat cast-iron cooking plate that goes over the fire and is used mainly for making tortillas, but also for roasting chile peppers and other vegetables. It is much like a griddle. A large cast-iron frying pan can be used instead. Place tortillas, so they do not overlap, on a medium-hot cast-iron griddle or in a heavy frying pan over medium-high heat. Turn frequently until soft and hot (about 30 seconds on each side). To Microwave: Place no more than 4 tortillas in at a time, arranged in a circular pattern with the edges barely overlapping. Heat for 20 seconds, turn them over and heat for 10 more seconds. Take one warm tortilla and place approximately 2 to 3 tablespoons of the chicken mixture into it slightly to one side. Roll the tortilla around the mixture and place it seam side down into the casserole dish. Continue to do this until you have used all the tortillas and mixture, or have filled the casserole. Spoon the remaining spinach/cheese sauce over the top of the enchiladas and top with the grated Monterey jack cheese. Place the casserole dish with the prepared enchiladas in oven and bake for approximately 20 to 30 minutes or until the top bubbles and the cheese is slightly browned. Remove from oven and serve with the extra tomatillo/poblano sauce. Enjoy!